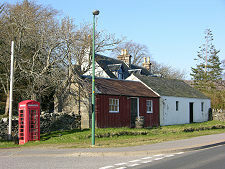 Achnasheen is a tiny settlement of just 28 people. 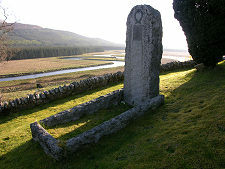 For hundreds of years it has lain at an important junction in the centre of the northern Highlands. Here the road from Inverness, just over 40 miles to the south east, splits in two. Head west from here and you pass Kinlochewe en route to Poolewe and Gairloch, or Torridon. Turn south west and you are on the road to Lochcarron, or the traditional route to Kyle of Lochalsh and Skye. For much of history getting to those places was less important than providing ways of allowing the cattle traditionally reared across the Highlands to be taken from those places to markets in Dingwall or Inverness. The first proper road reached Achnasheen in 1819, en route from Dingwall to Lochcarron, then Strome ferry and Kyle of Lochalsh. 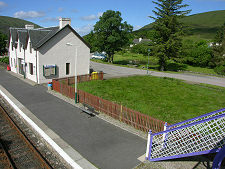 In 1870 the railway from Inverness to Kyle opened for business, with a station at Achnasheen. 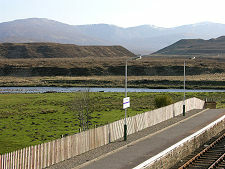 This became the railhead for a large part of Wester Ross including Poolewe and Gairloch. 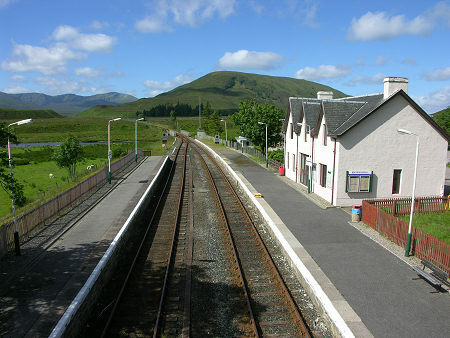 It also became the location of the Achnasheen Hotel, built by the railway company right next to the eastbound platform of the station. 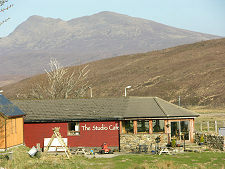 Achnasheen's name comes from the Gaelic for field of the storms. 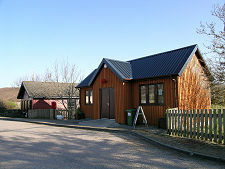 The village is actually no more storm prone than anywhere else in the north west Highlands, but it sits at a height of around 500ft in the broad valley of the River Bran, offering very little shelter of any kind. It is easy to believe that any cattle drovers caught by a storm here would remember it. 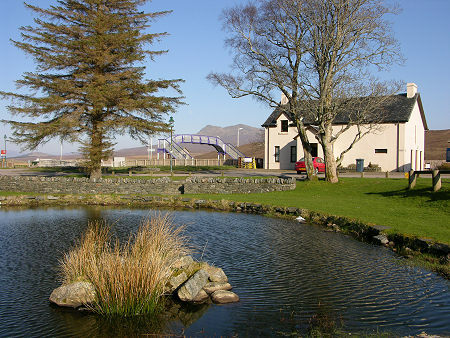 The Achnasheen Hotel burned down in February 1994 and its site was cleared. 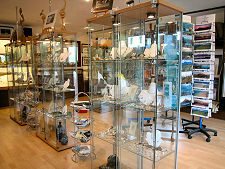 However, Achnasheen remains home to a post office and shop, and to the Studio Gallery and Cafe, a regular stopping off point for coach tours of Wester Ross. 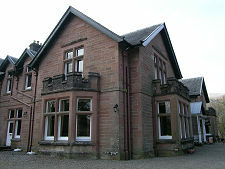 A few hundred yards along the road to Lochcarron is the Ledgowan Lodge Hotel offering both traditional hotel accommodation and a bunkhouse for walkers and others on a budget. 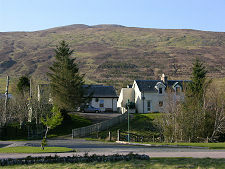 On the opposite side of the valley to the Ledgowan Lodge, and to the south of the start of the road to Kinlochewe, are the Achnasheen Terraces. These flat topped features look artificial, but are in fact glacial outwash deltas that have been here for 10,000 years or more. A few miles east along Strath Bran, a brown tourist sign at Achanalt directs visitors up a steep grassy path to the graveyard at Cnoc na Bhain. Here you find the grave of Captain Bertram Dickson, a pioneer of military aviation in the years before the First World War. Captain Dickson may not be the most famous of Scots: but Strath Bran is a regular low level route for modern military fast jets, and don't be surprised if you see one dipping its wing in salute as it passes Achanalt.